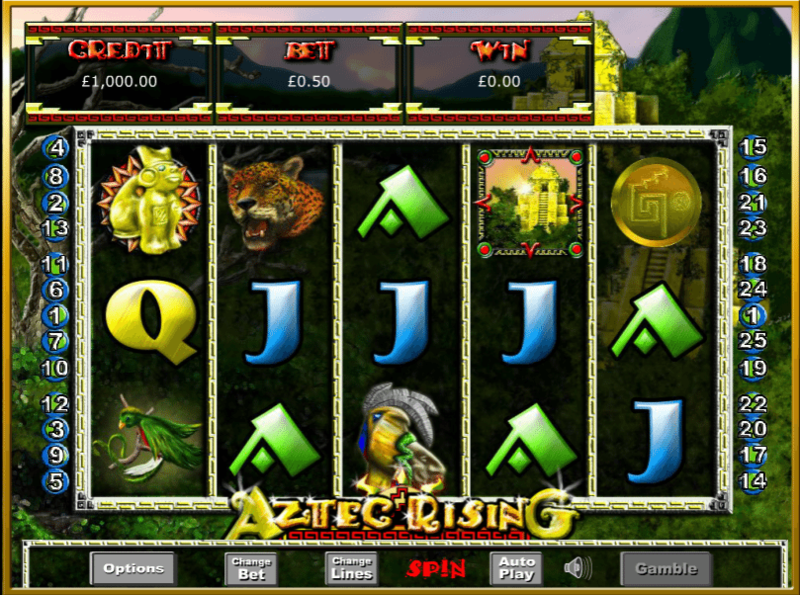 Here's a superb new online slots from Eyecon which you can enjoy playing. 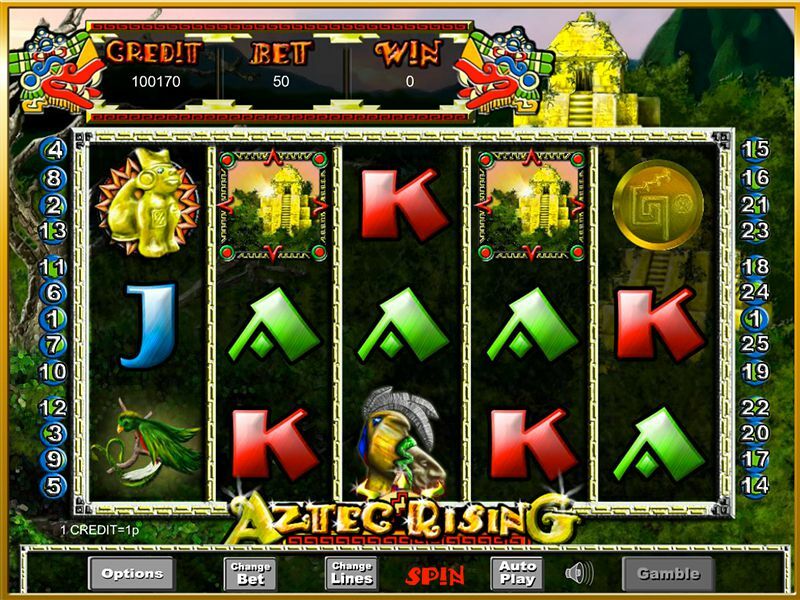 The mysterious Aztec civilisation have been intriguing people across the world for generations and this ancient setting makes the perfect backdrop for a 5 reel online casino full of adventure and clever twists and turns. If you love promo's, visit SlotsBaby today. Journey to central Mexico and join the enigmatic Aztecs for 5 reels and 25 paylines of adventurous escapades. As always with online slots in this format the aim of the game is to get three classic icons in a row on an active payline. Once you’ve secured these it’s time to move onto the more elusive feature symbols, in this game the Aztec symbols and drawings. Look out for these Aztec specials as these are the key to getting your hands on your prize. You can choose your preferred number of lines so the total stake is in your hands. Auto-Play is another option you can choose if you want some quick fire casino action. Golden Temple: The Golden Temple is the wild symbol, and will help you get you prizes multiplied. The Golden Temple substitutes for any other symbols (other than the Calendar and Coin which are scatter symbols) when appearing on reels 2 and 4. If this wild creates a winning line, all prizes given are doubled! Coin symbol: The magical coin symbol will lead you to a free game. When you get 3, 4 or 5 coin symbols in a row you’ll be rewarded with 15, 20 or 25 free spins. In these free games, all prizes are tripled! The coin scatter symbol also awards pays of 100, 20, 5 and 2 credits for 5, 4, 3 or 2 such symbols on top of handing out free games. All in all a great symbol. Cryptic calendar: The elusive and magical Cryptic Calendar symbol you really need to get on your radar is the cryptic calendar symbol. This mystical Aztec symbol will unlock the Aztec Rising bonus round which will bring free games and bigger prize chances. There’s also a gamble feature that enters the equation throughout the game. 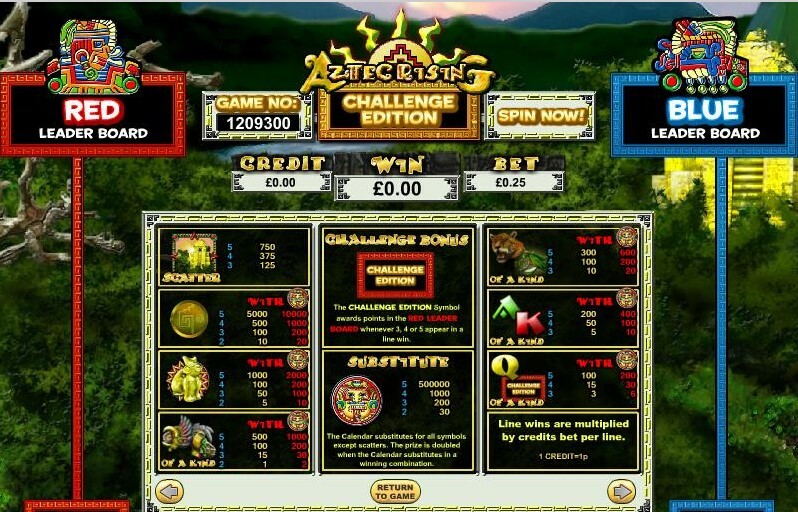 When the gamble button turns darker grey that’s the time to make your decision to stick or twist, to be a brave Aztec warrior or to keep your winnings close and safe. You’ll then get the chance to play a simple card game and double your winnings! The gamble button only changes colour slightly when the option is on the cards so make sure you keep an eye on it as you make your way through the game.